They are: High Flow Loading Nozzle; Enhanced High Flow Nozzle Valve; Nozzle Valve Spring and Enhanced Valve Blocker. 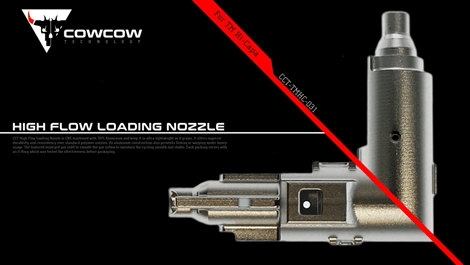 High Flow Loading Nozzle is CNC with Aluminum 7075. It is ultra-lightweight as 8 grams. It results the high durability and prevent flexing and warping in heavy usage. The featured enlarged gas inlet is able to smooth the gas inflow and maintain the cycling smooth and stable. Each packing serves with an O-Ring which was tested the effectiveness before packaging. Enhanced High Flow Nozzle Valve features smooth and enhanced gas flow. Our design can effectively minimises the gas loss and thus fasten the entire cycling. It also made by CNC with Aluminum 7075. Each packing serves with a set of our new Nozzle Valve Spring. Nozzle Valve Spring constructed with high strength spring steel and hard coating to enhance it durability and stability. 2 different spring options let professional user able to equip the proper one to optimise the performance. White Blue Spring is pre-set as balance on Joule power and recoil. Black spring is around 10% increment on Joule power. 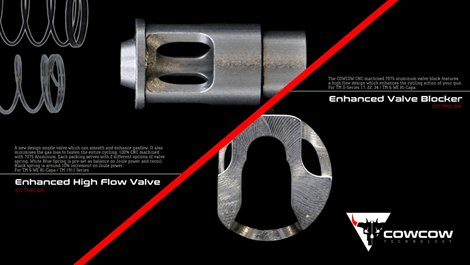 Enhanced Valve Blocker is also the perfect partner for CCT Aluminum Loading Nozzle series. With the high flow design, the gas flow is smooth and stable to the blowback action. The 7075 Aluminum can increase the durability which prevents flexing and warping under hard use when comparing to the original plastic one.